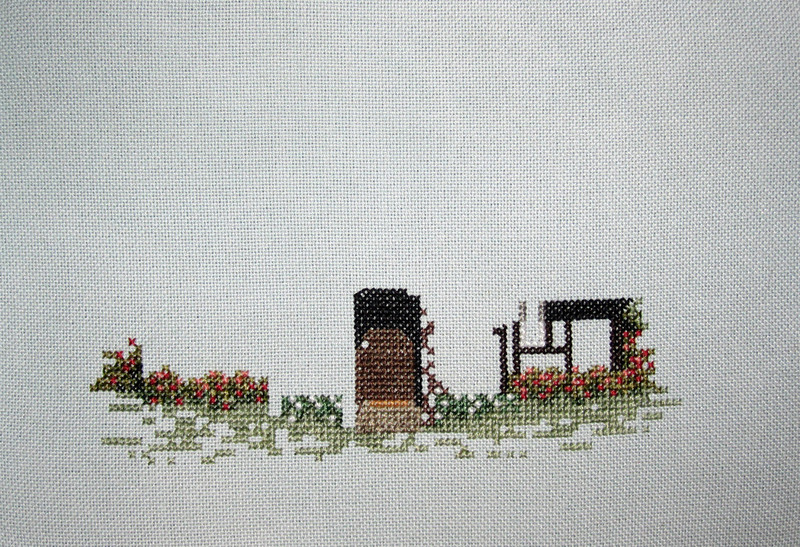 Here's the first picture of an old kit that I'm finally stitching. I picked up four Cross My Heart cottage kits AGES ago and I'm just now starting to stitch them (well, this one at least). I switched the fabric out with a hand-dyed Silkweaver fabric that is very subtle and is a light blue/gray color (I had to use the flash on the camera so it's a little washed out). I really like the Cross My Heart designs, but I really hate hand-lettered charts! There are some nice details around the windows, but the chart is really hard to read because of the partial stitches and backstitching lines. I'm stitching the whole stitches right now and then I'm going to blow up the chart around the harder to read areas and see if it gets any easier to see.